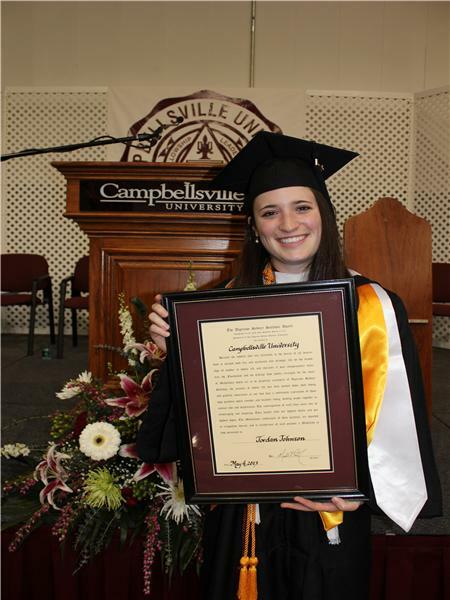 Jordan Johnson of Russellville graduated from Campbellsville University of May 3 as valedictorian. She earned her Bachelor of Science degree in political science and homeland security with a perfect 4.0 GPA. The Logan County High School graduate was also awarded the prestigious Algermon Sydney Sullivan Award. CU President Michael Carter said, “Jordan was exemplary in servant leadership and campus life.” The service-based Algernon Sydney Sullivan Awards have been given out since 1890 to recognize individuals whose “nobility of character” and service to others sets them apart as examples to all. Mr. Sullivan rose to success in New York City as a respected attorney. After his death in 1887, the Society sought to honor him, and the award bearing his name was established in 1925 by the Sullivan Memorial Committee and the New York Southern Society. The award seeks to perpetuate the excellence of character and humanitarian service of Algernon Sydney Sullivan by recognizing and honoring such qualities in others. It was first presented in June 1925 at the George Peabody College for Teachers in Nashville, now a part of Vanderbilt University. The Algernon Sydney Sullivan Foundation facilitates annual awards on 61 college and university campuses across America. Sullivan Awards are highly prized, and over the years have been bestowed on notable individuals including Eleanor Roosevelt, children’s television's Fred Rogers, Supreme Court Justice Lewis Powell, Nobel laureate William Lipscomb Jr., and one of Kentucky's sons, Vice President of the United States Alben Barkley. While at Campbellsville, Jordan Johnson served internships with the Legislative Research Commission in Frankfort, U.S. Sen. Mitch McConnell, and Congressman Ed Whitfield. She also served as consular assistant for the U.S. State Department in Kuala Lumpur, Malaysia. Johnson is now in the graduate program at the Patterson School of International Commerce at the University of Kentucky. She is the daughter of Rob and Julie Johnson of Russellville.